Vast Public Indifference: "He'll Gitcha"
Every time I read one of John Boyle's thinly-veiled celebrations over the providential misfortunes of his political enemies, I think of the video of the little girl who says, "Don't talk back to Darth Vader, he'll gitcha." Maybe God isn't Darth Vader, but in this diary, he's certainly in the "gitcha" business. John Boyle's God is aligned with John Boyle's politics and regularly brings his wrath down on the heads of Boyle's political opponents. He sends lightning to destroy Andrew Oliver's house and hurricanes to drown thousands of potential British army recruits. In April of 1766, Providence came looking for Brigadier General Timothy Ruggles. Ruggles' transgression: as president of the 1765 Stamp Act Congress, he refused to endorse the anti-Stamp Act petitions that the group sent to the King and Parliament (years later, Ruggles' Tory sympathies made it necessary for him to flee to Nova Scotia). A Congress of Deputies from the several American Colonies met at New-York in October last, and petitioned the King, Lords, and Commons, severally, for a Repeal of the Stamp-Act. The Deputies on the part of this Govt. were Brigadier Genl. Ruggles, of Hardwick, James Otis, Esqr. of Boston, and Oliver Partridge, Esqr. of Hatfield. On the 12th. 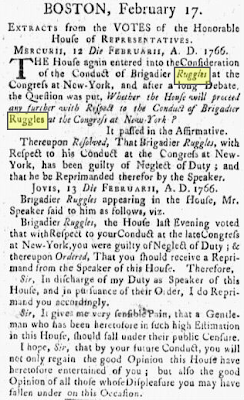 Instant, Brigadier Ruggles was reprimanded by the House of Representatives for neglect of Duty at said Congress, particularly in refusing to sign the Petitions The Conduct of the other two Gentlemen was approved of. Brigadier General Ruggles of Hardwick, being with some Men who were falling some Trees, one of the Trees falling sooner than expected, struck the Brigadier before he could get out of the Way, whereby he was greatly bruised, and had several of his Ribs broke, also one of his Arms in two places. As in his comments about the destruction of Oliver's house, Boyle did not explicitly attribute Ruggles' injuries to divine retribution, but it's impossible to overlook his insinuations. In Boyle's mind, God's creation is allied with the Whig cause. Lukewarm patriots, beware!